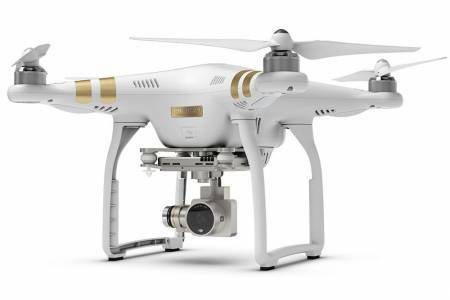 The Phantom-3 is a factory built Quad-Copter from DJI, and offers a high quality 12 megapixel, 3 axis stabilised camera, capable of shooting in 4K (30p/25p & 24p) or 1080 (60p, 50p, 48p, 30p 25p & 24p). The high quality lens, for 1/2" sensor, has a 94º angle of view (equivalent to 20mm in full frame). The Phantom-3 is an ideal, multi-purpose drone for single person operation, and is the perfect tool for fast "chasing" sequences as it can fly at up to 60 Kmh, and has a range of up to 2km from the operator (depending on conditions and local laws). As with all single operator drones, there are limitations on panning, particularly when the subject is close to camera. The kit comes with 3 batteries, each capable of powering the drone for up to 25 minutes and there are 2 chargers, that can refill a battery in around 1 hour.